Reed Canary Grass seeds to grow your own plant at home. 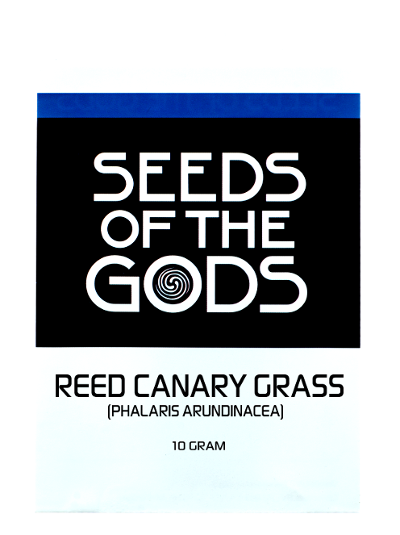 The leaves of Reed Canary Grass contain the psychoactive substances N,N-DMT ‘regular’ DMT and 5-MeO-DMT. When combined with an MAOI to create anahuasca (a sort ayahausca), these substances can trigger intense trips with hallucinations and visions. Contains 10 grams of Canary Reed Grass seeds. In hermetically sealed packaging. The leaves of the plant Reed Canary Grass (Phalaris arundinacea) contain the psychoactive substances N,N-DMT and 5-MeO-DMT. N,N-DMT (usually simply called DMT) causes a quite intense, euphoric trip with visions and hallucinations. 5-MeO-DMT sometimes gets confused for ‘regular’ DMT, but is certainly not identical. 5-MeO-DMT is a much more potent substance and causes a different kind of trip: more sensual, bodily, and emotional, and less visual. 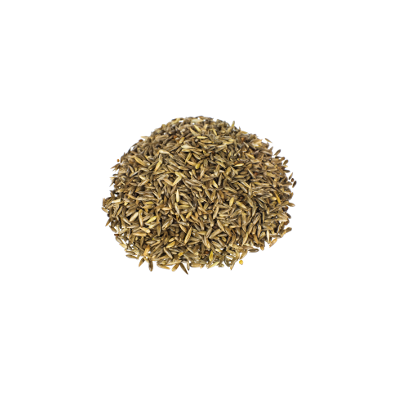 The seeds of Reed Canary Grass contain no psychoactive substances. You will have to cultivate the seeds yourself in order to obtain N,N-DMT and 5-MeO-DMT. Reed Canary Grass has only recently become popular for its psychoactive properties. Its various uses and preparations are still in an experimental phase. In other words, Reed Canary Grass is definitely not suitable for rookie psychonauts! It’s possible to smoke the leaves of Reed Canary Grass, but this rarely leads to strong effects. If you want to smoke the plant, it’s advisable to first prepare an extract of the plant and let this seep into a smokable substance - for instance tobacco, mapacho or kanna. Some people are currently experimenting with Reed Canary Grass as an ingredient for anahuasca or ayahuasca analog - a drink that mimics the effects of ayahuasca with an alternative composition and preparation. To do this, you will need to combine an extract of the active substances in Reed Canary Grass with an MAOI (monoamine oxidase inhibitor), to make sure that your body doesn’t break down the active substances. Syrian Rue is commonly used as an MAOI. Without an MAOI, N,N-DMT and 5-MeO-DMT cannot reach the brain and won’t have any hallucinatory effects. For detailed instructions on how to prepare the required DMT-concentrate, you can head to Erowid. Reed Canary Grass is a species of grass that resembles reeds, with stalks reaching up to two meters in height and small white or white-pink flowers. Reed Canary Grass is a perennial plant, meaning it can blossom multiple times during its lifespan. As the name suggests, Reed Canary Grass often flourishes in marshy areas or near the waterfront. The plant thrives in wet circumstances: near water or in soil that is kept very moist. Reed Canary Grass grows quickly and easily, as long as it finds itself in moist soil. To germinate the seeds, sew the seeds on a layer of soil of at least 10 centimeters, keeping about 5-10 millimeters of space in between the seeds. Gently press the seeds into the soil. The seeds should sprout quickly, and after a few months you can begin harvesting. Reed Canary Grass or Phalaris arundinacea belongs to the grass family Poaceae. It is found throughout the world, thriving in marshy, swampy areas of North America, Europe, Asia and North Africa. Reed Canary Grass is often grown by farmers to create hay or pastures for cattle. Writers of antiquity possibly were already familiar with the psychoactive possibilities of Reed Canary Grass. In his poem Metamorphoses, The Roman poet Ovid describes how the fisherman Glaucus transforms into a sea god after eating a grassy plant - a kind of shamanistic experience. In spite of this, Reed Canary Grass isn’t part of any known shamanistic tradition. Recently the grass has garnered more attention and is widely tested to explore its psychoactive possibilities. The presence of the toxic substance gramine sometimes hinders these experiments. Some research suggests that certain sheep suffer brain damage as a result of eating large quantities of Reed Canary Grass. This probably has to do with the high gramine content. Reed Canary Grass contains the highly poisonous substance gramine. Insufficient research has been done to say with any certainty in what quantities this substance can cause harm when using a Reed Canary Grass extract to create anahuasca. Many people who have experimented with Reed Canary Grass report unpleasant side effects, such as intense nausea and vomiting. Generally, other sources of DMT are considered preferable. Because little is known about the use of Reed Canary Grass, it’s recommended to be very careful with dosage and combinations with MAOI. Don’t use too much of it and be mindful of potentially dangerous chemical combinations.